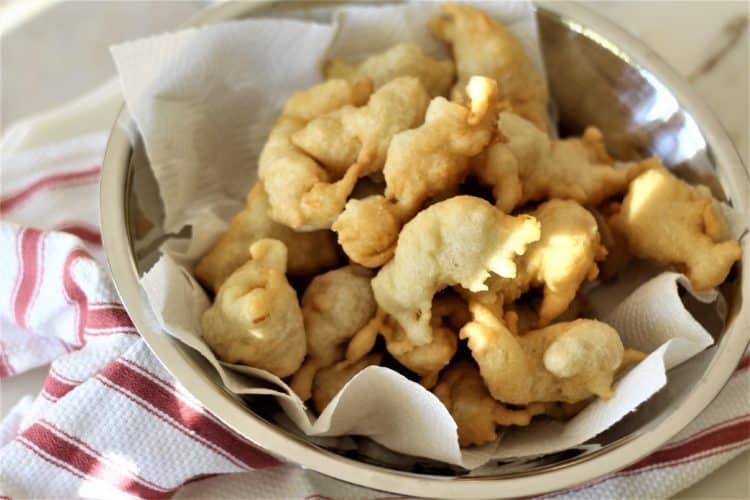 Sfinci, a Sicilian specialty, are leavened fried dough balls which are traditionally served on Christmas Eve. My grandmother served them with a salt cod stew containing potatoes, tomatoes and olives. I’ve got to put that dish on my to do list. Sfinci can also be filled with anchovies (that’s really Sicilian) but as we’re not fans of anchovies my mom has always left them out. Instead, for some time now she has been filling some sfinci with ricotta and ham. And you know anything stuffed with ricotta has got to be good! My mother also enjoys her sfinci sprinkled with granulated sugar as a sweet treat. So where did this strange word sfinci come from? I am not certain but a while ago I came across a recipe for ‘sfendg’ in a middle eastern cookbook. 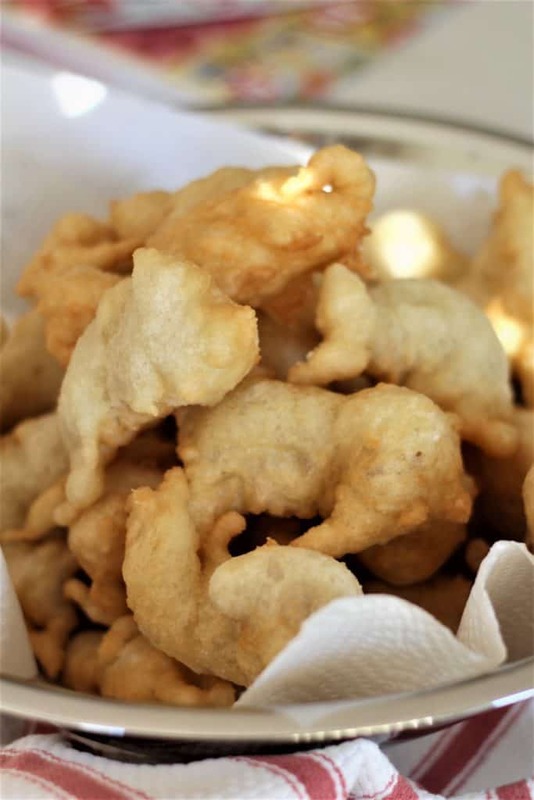 Sfendg also consist of leavened dough shaped as rings and fried. This makes sense as we know that Sicily was occupied by Arabs several centuries ago. I’m always fascinated about the origins of language and, of course, food. I have never made sfinci myself, so earlier this week I set off to my mother’s house in order to watch her make them and document the recipe. This is always a challenge as she has never measured ingredients before. It’s always the same story: “use as much flour as needed”, my mother says. But what does that mean if you have no idea what texture you’re looking for? I watched my mother prepare herself before making the dough. She took a lemon half to the sink and proceeded to scrub her hands and wrists thoroughly, explaining that she always disinfects this way before preparing dough. She then reached over to a clean hand towel to dry her hands. It was not unlike watching a surgeon preparing for surgery! I was in awe at how methodical she is when it comes to cooking and hygiene. She prepared the dough in no time, vigorously mixing it with her hands in circular movements. 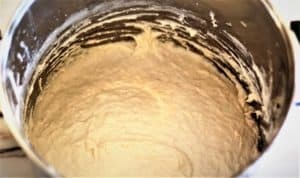 A mixer will not do as you would not be able to “feel” when the dough is ready. Actually, it’s more like a very thick batter than a dough. She then placed the batter to rise in the same way I’ve watched her prepare bread during my childhood. She covered it with several wool blankets (not used for any other purpose but this) so that it may be completely free of any draft. Again, this is a technique that my grandmother used back in Sicily. And then we had to wait. She said it would probably take 4 hours! But I thought surely not since we made a smaller batch than she would normally prepare for Christmas. So we headed out to run errands and came back 3 hours later. She lifted the blankets and I was thrilled to see that the batter had tripled in size! Super, we’re ready to fry, I thought. But she said no, it was not ready. One hour later my mother lifted the blankets once more and right before my eyes the batter actually bubbled! Now I understoond. Had I begun frying the batter an hour earlier, the result would have been heavier, less fluffy sfinci. A true lesson in patience! We finally began to fry them. I watched my mother drop spoonfuls of batter into the hot oil, using her finger to scrape the batter from the spoon. They immediately puffed up into these alien shaped dough balls. As I mentioned earlier, my mother usually stuffs a few of the sfinci with ricotta and ham. Preparing the stuffed sfinci is quite a task and if you attempt to do so, I recommend you prepare a few before your oil is heated. Approximately twice the amount of batter normally used for plain sfinci is placed on a well floured surface. I watched my mother carefully flatten this incredible sticky dough, using more flour as needed, into a rectangular shape. She then placed half a slice of ham on the dough and topped it with about a tablespoon of ricotta. The dough is then rolled over the filling. It will resemble a lumpy, oddly shaped sticky mess but don’t worry as it will puff up nicely in the oil. . It would not be Christmas Eve if the sfinci are not on the table. Truly a tradition worth preserving and passing on to my children as well. If you give this recipe a try, please tag me with #mangiabedda on Instagram so I can see your sfinci. Buon appetito! Sfinci are a typical Sicilian specialty served on Christmas Eve at our house. Pour 1/2 cup water in a small bowl and stir in sugar. Pour the yeast over the water and let stand 10 minutes. Pour the remaining 2 cups water in a large bowl. Stir in the yeast mixture. Add the flour and salt and using your hand, stir the mixture vigorously using a circular motion. 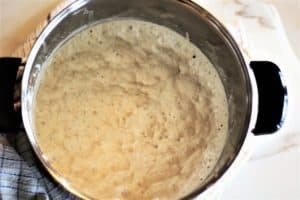 Continue stirring this way for about 5 minutes until you have a thick, smooth batter. Cover well, using blankets if you wish, and let sit for 4 hours. 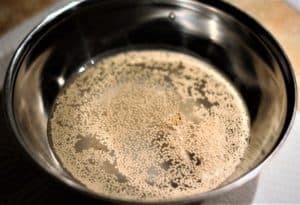 The batter is ready when it bubbles form on the surface. Fill a heavy bottomed sauce pan half way with vegetable oil. Slowly heat the vegetable oil. In order to test if it is hot enough, take a small piece of the sfinci dough and drop it in the oil. If it immediately begins to sizzle, the oil is ready. 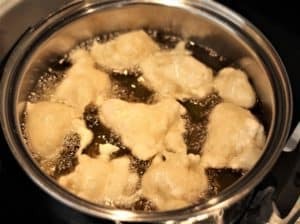 Using a tablespoon drop the dough into the hot oil, scraping off the spoon with your finger or another spoon. Do not overcrowd your pan. After about 1 1/2 minutes, carefully turn the sfinci over so that the other side may brown as well. When they are a light golden color, remove the sfinci with a slotted spoon and place on a dish covered with paper towels to absorb the excess oil. Serve hot or reheat in the oven before serving. They look so good Nadia! 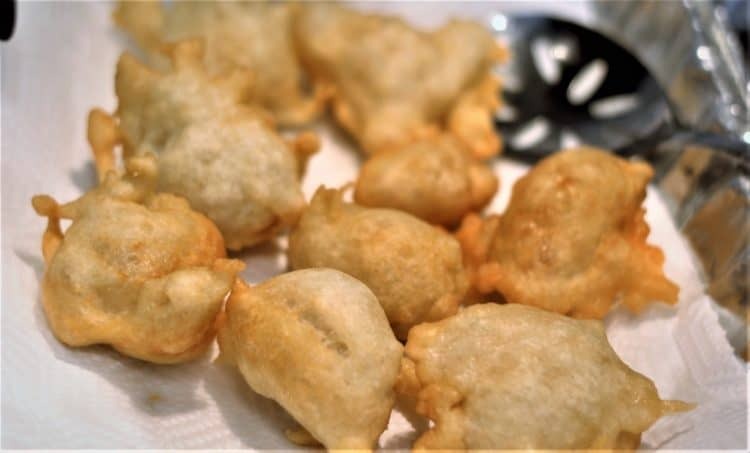 In all italian homes there is a lot of deep frying going on for Christmas. We had our share too ;-) . I'd love to have some sfinci right now, with sugar on top, like your mom likes them! Thanks so much Nicoletta! My favorite are the ricotta stuffed ones. Can't wait until Christmas Eve! 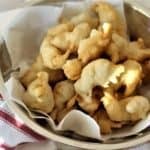 Hello Yvonne, you can find typically sicilian recipes on my blog by selecting the "sicilian recipes" category in my recipe directory. I hope that helps! 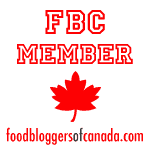 Was there a specific recipe you were looking for that I might be able to help you with? Truely enjoyed your article on sfinci. My father was born in Sicily and we make those little Italian donuts for Christmas also, they are delicious. I’m gonna look forward to other recipes from you. Thank you so much, Patricia Ventimiglia Mason. Hi Patricia, I"m so glad you enjoyed it! Yes sfinci are definitely delicious, and so addictive! Thanks for taking the time to write to me!